This study has 14 sessions, incorporating an introductory session and 13 lessons. The Study Set includes the Study Guide by Catherine Upchurch (Galatians) and Clifford M. Yeary (Romans) and a commentary, Galatians and Romans, by Brendan Byrne (Liturgical Press). Brendan Byrne, SJ, is professor of New Testament at Jesuit Theological College, Parkville, Victoria, Australia. A member of the Pontifical Biblical Commission (1990–96) and Fellow of the Australian Academy of the Humanities (2000–), he is editor in chief of the theological journal Pacifica. Byrne is the author of numerous books, including Romans in the Sacra Pagina series and a three-volume commentary on the Synoptic Gospels (Liturgical Press). He is currently preparing a similar commentary on the Gospel of John. 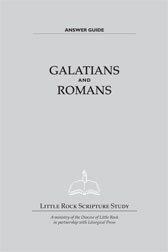 Galatians and Romans are pivotal for those seeking to understand the faith and teaching of the Apostle Paul. Many of Paul's themes are shared by Galatians and Romans, but the tone and length of the two works differ sharply. This study opens with Galatians because it was written first. Those who wish to adapt the study will find it easy to split the study into two parts or to simply focus on either Galatians or Romans, as best fits their needs. The Commentary includes a helpful glossary which clarifies the meaning of terms frequently used in discussions of Paul's theology. Galatians addresses Paul's understanding of Christian freedom and justification by faith. He reprimands the Galatians for deserting the Gospel by seeking justification through circumcision rather than through faith in Christ, who achieved our salvation by his sacrifice on the cross. Romans is the longest of Paul's letters. It addresses the universal reality of sin in the world and the need for salvation in Jesus Christ. It explores both the strength and limits of the law of Moses. Paul examines the new life attained in the Holy Spirit as God's gift and proclaims the mystery of God's plan to save Israel. Romans also highlights the ethical demands of the gospel.